India opening in the prestigious Commonwealth Games is superb.Indian girl Saikhom Mirabai Chanu won the gold medal in the women's 48kg weightlifting final on the first day of games. 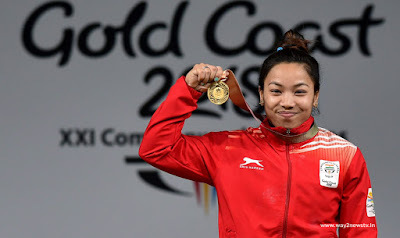 She was the first woman won gold medal behalf of the India in the 2018 sports.Chanu has performed well and has been greeted by various groups across the country. 23 years Chanu is a Senior Ticket Checker in Indian Railways. in the World Weightlifting Championship she lifted 198 kg weight , won gold medal and qualified for the Commonwealth Games by creating a national record. After the 22 years Karnam Malleswari Record, the second Indian girl to achieve this feat was chanu. Earlier, Gururaja took the silver medal in the men's 56kg weightlifting. he won the first medal to India .